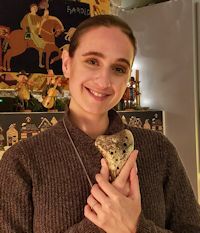 The year started off with a very interesting program on the ocarina (an ancient wind instrument) at Susan Poelchau’s home. (We may have heard the first rendition ever of The Triangle played on ocarina!) We also were excited to welcome a new member, Amy Canchola, into our group! (Great news update – Amy just completed her doctorate at UNT in February. 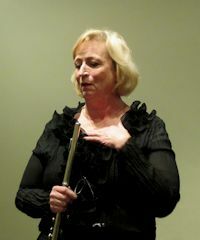 Click here to hear her doctoral lecture/recital on composer/vocalist Maria Greber: https://youtu.be/VN99ERmJX7A. The concert series resumed in January with a concert by the amazing Menagerie Multicultural Ensemble, which included performers and instruments from around the world – Chinese instruments including a pipa and sheng, a Venezuelan guitar, world percussion, as well as piano, guitar and more familiar instruments. The repertoire spanned quite a range too, including jazz with a vocalist. Talk about diversity at its best! It made me so proud to be a part of the group that sponsors such unique concerts as a gift to the community (with well over 100 in attendance that day). And last week, the concert series presented the Viola de Gamba project, with a diversity of performers, including a high school group from Conroe TX, retirees, and professionals, all making music on instruments popular during the Renaissance. How fun it was to share our February meeting with the SAIs at First Presbyterian Church, with performers from both groups! 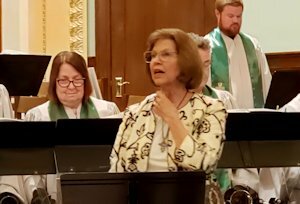 Special thanks to Phyllis Wilson, who not only arranged for us to meet at the church, but also had her awesome handbell choir play on the program. Carol Lynn Mizell, one of the SAIs in attendance, was the composer of the final handbell piece. How funny it was when she and our Tena Hehn figured out that they were the same people who used to live next door to each other in the dorm at NTSU! What a small world, especially when music brings us together!! In February, Ashley, Lisa and I attended the Mu Phi South Central District 2 Convention at TCU, along with about 100 enthusiastic, energetic, talented collegiate members! The future of Mu Phi appears to be in great hands! What a treat we have coming up on at our meeting on Tuesday, March 19 at Lisa Beyer’s house. We’ll be initiating a new member, Francis Vu, and we’ll hear Ashley and Basil Bouras perform clarinet duos! (I wonder when baby Evelyn will start clarinet lessons?! :) We’ll also get to vote on this year’s scholarship winner. Hope to see you there! 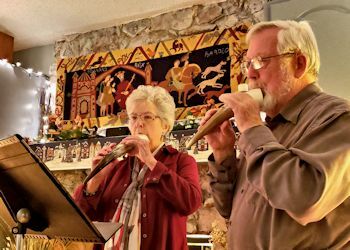 Susan and Harald Poelchau introduced the chapter to their collection of gemshorns by playing two short medieval pieces on these unusual instruments made from zebu cattle horns. These instruments come in soprano, alto, tenor and bass depending on size of the horn. Thanks to Susan for hosting with able co-hosting from Kimla Beasley. Thanks to Phyllis Wilson we were able to meet at the recently renovated sanctuary and parlor at First Presbyterian Church downtown. We met for our annual joint event with the SAIs for a beautiful program. 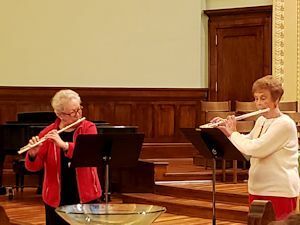 SAIs Judy Dobbins and Shirley Howard, flutes, played Blue Skies - Irving Berlin, All of Me - Simons and Marks and When You Wish upon a Star - Leigh Harling. 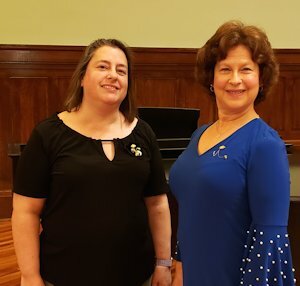 SAI soprano Judy Kline (right) and pianist Betsy Durnin performed Art is Calling for Me by Victor Herbert. 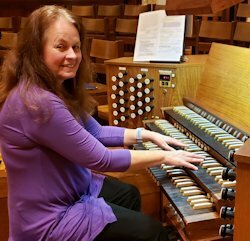 MPE organist Nancy Laine wowed us with the Toccata by Eugene Gigout and Finale (from Symphony No. 1) by Louis Vierne. The wonderful handbell choir of First Presbyterian played a variety of bells and demonstrated some. 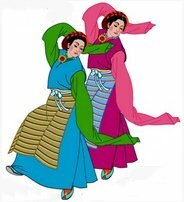 They played Fantasia on ENEMEZER by Williams, Capriccio No 2 by Michael Helman, Greensleeves, and Here We Come Good Christian Friends - a German melody arranged by Carol Lynn Mizell. Phyllis Wilson was the able director. The whole group sang along with the last piece joined by volunteers from the audience to add a descending scale on the handbells. The Mu Phis hosted with a tempting spread of goodies and punch. Thanks to all who brought refreshments. Lisa Beyer will host at her home: 1910 Cap Rock Drive, Richardson. The program will feature Ashley and Basil Bouras, clarinet duo. We will initiate our new member Francis Vu at this meeting. Please bring lunch items to help feed hungry students who will provide our program. Lisa Beyer will coordinate our lunch. Let her know what you are bringing. We will announce our annual scholarship winner and that winner will perform. Our host is Kimla Beasley and the location is 18951 Westwood Place, Dallas, TX 75287. This is the home of Kimla's friend Pam who is lending it to her for the evening. The program will feature Kimla Beasley and Claudia Jameson, sopranos. We need a co-host for this meeting. Please let Kimla Beasley know when you would like to co-host a meeting (bring goodies). Amy was a Mu Phi at Butler University in Indiana. 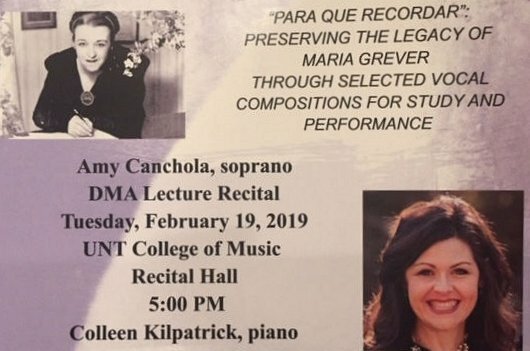 On Tuesday, Feb. 19, she presented her DMA lecture/recital at UNT. That’s the last step to finish her doctorate. We congratulate Amy on her achievement! Amy attended our January meeting and is interested in some of the scholarships that Mu Phi offers. Francis, our special election member, is the Director of Choirs at Centennial High School, where he directs the A Cappella Women, Titan Men, Bella Voce, and Lyric choirs, along with Vibe, the premier vocal jazz ensemble. 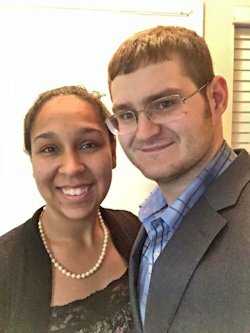 Previously, Francis taught at McKinney HS in McKinney, TX, and Rouse HS in Austin, TX. His choirs have received consistent Superior ratings in concert and sight reading at UIL Contest, and his students have enjoyed the experience of singing in the All-Region and All-State choirs. Francis also serves as the Director of the Turtle Creek Chorale Chamber Chorus. 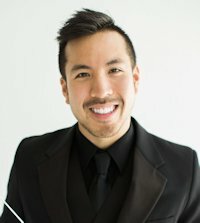 He is the recipient of many awards and is currently pursuing a Master of Music degree in Choral Conducting at Michigan State University. Contact the President of Webmaster for more details on contact information. You can “Like” the Dallas Alumni Chapter on Facebook to keep up with messages and events. Type MuPhiEpsilonDallas on the search line within Facebook, then click on LIKE us. This is especially helpful in promoting our concerts at the Library. Share with your friends what we are doing. You can post your own performances there as well. We just cannot use that space to advertise or sell products. Your Newsletter Editor Mary Williams appreciates having news and photos to print with your help. (No help? No news.) Please let her know what you are doing or if you have changes to your information. Our condolences to Pat Suitt on the death of her husband Charles who passed away in January after a long illness. His service on Saturday, February 2 was held at Preston Hollow Presbyterian Church. He sang in several choirs who performed at his service. Several Mu Phis attended this beautiful tribute to Charles. Ashley Bouras’ Youth on Stage group presented “Little Shop of Horrors” in February at Cox Playhouse in Plano. Mary Ann Taylor spent a month in Germany with the Taylor Boys Play It Where It Lays Society (grandboys) and their parents. They had trips to Austria, France, and Switzerland with lots of snow. Almost never saw the sun. Mary Ann reports: "Too many things for a real by-the-numbers but here are two: Number of Yatzees I had in one game: 3. The boys could not bear it. The number of times some adult asked “Who tooted?” Innumerable. The 2-year-old will always admit guilt regardless of fact, however. Glad to be home but will miss them all." Mary Williams just returned from a cruise to South America that featured an Atlantic storm and a Pacific storm, with lots of ship rocking and rolling. However, rounding Cape Horn happened on a smooth, sunny day. 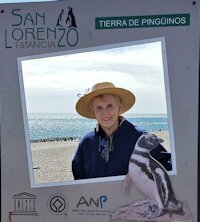 Several interesting tours including Buenos Aries, Montevideo, Santiago and visits to penguins on the UNESCO World Heritage site on the Valdez Peninsula and Tierra del Fuego National Park (the end of the world). 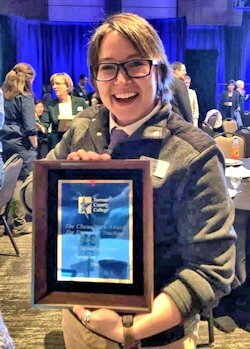 Jenny Smith didn't share anything about this publicly, but about a year ago she was nominated for a prestigious award at her college called the "Chancellor's exemplary teaching award". As her college district is one of the highest in enrollment in the state, and there are so many talented teachers, this is a big honor. Three people were nominated per campus, one winner per campus, and five winners in the whole Tarrant County Community College district. The portfolio she had to put together was equivalent in scope, or even exceeded, what she had to do for tenure. She says she wasn't in the highest of spirits in March when she had to put everything that encompassed putting her teaching together in one document. At the time her Dad was very sick and she had no free time. She worked until midnight most days. It was during midterms and she was probably depressed. It was hard. But she gave her application her very best try to showcase what she does as a teacher and to help her peers in and out of class. 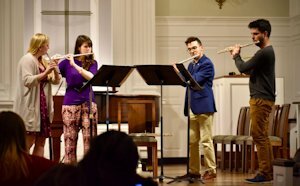 Susan Poelchau reports: The Concert Series Committee is happy to report we are having a very good spring, with several interesting chamber music concerts drawing audiences from 70-120 visitors – topping audience attendance records for us! Thanks are due to Andrew Anderson of the Dallas Public Library for his continuing help, and to Mary Williams for her tireless effort to keep the programs and website up to date - no small task. We really appreciate the contributions of Kimla Beasley with her engagement and great creative ideas for twenty-first century media communication. Yay, Kimla! Thanks to chapter members Susan Poelchau, Tena Hehn, Claudia Jameson and Nancy Laine who helped provide a light lunch for the viola da gamba students coming from Conroe for the March 3 program. This was a marathon effort of planning and execution! Just started - our Piano Mania mini-series of six super-good pianists playing the rest of the concerts this season. Come to the First floor Auditorium at the downtown Library at 3 pm on Sundays and bring your friends. They will thank you. New: a mailing email list of our "regulars" and others who would like to keep informed as to what is happening each week. Send email addresses of your contacts to Kimla Beasley who will build this database and send concert info. See more photos on our Facebook page for a look at some of the past performers and their instruments. https://www.facebook.com/MuPhiEpsilonDallas/?ref=bookmarks. Please share these posts on your page. The Mu Phi Epsilon South Central District 2 Convention was held at TCU on Feb. 23. Over 100 Mu Phis from Epsilon Epsilon (TCU), Phi Xi (Baylor), Phi Tau (UNT), Delta Pi (Tarleton State), Beta Mu (Texas A&M Commerce), and Dallas Alumni experienced a treat as we built bonds of music, friendship and harmony. The Conference was hosted by the Epsilon Epsilon chapter at Texas Christian University in Fort Worth. Ashley Bouras, Lisa Beyer and Nancy Laine represented our chapter. An interesting array of workshops included tips on grad school, new teacher systems, and performance anxiety. Speakers included Dr. Sheri Neill, Chair of Music Education at TCU, Dr. Amy Stewart, Professor of Music at TCU, and Katsuya Yuasa, 2017 Mu Phi Epsilon International Competition Winner. In addition to fabulous sessions, there were social events, round-table discussions and a recital. Ellen Sackett, the new editor of the Triangle, was also in attendance. Committee sessions allowed chapters to share ideas and brainstorm solutions with each other. The day ended with a wonderful recital! The future of Mu Phi looks very bright! Ellen is a harpist turned journalist and will be initiated soon by the Denton chapter.